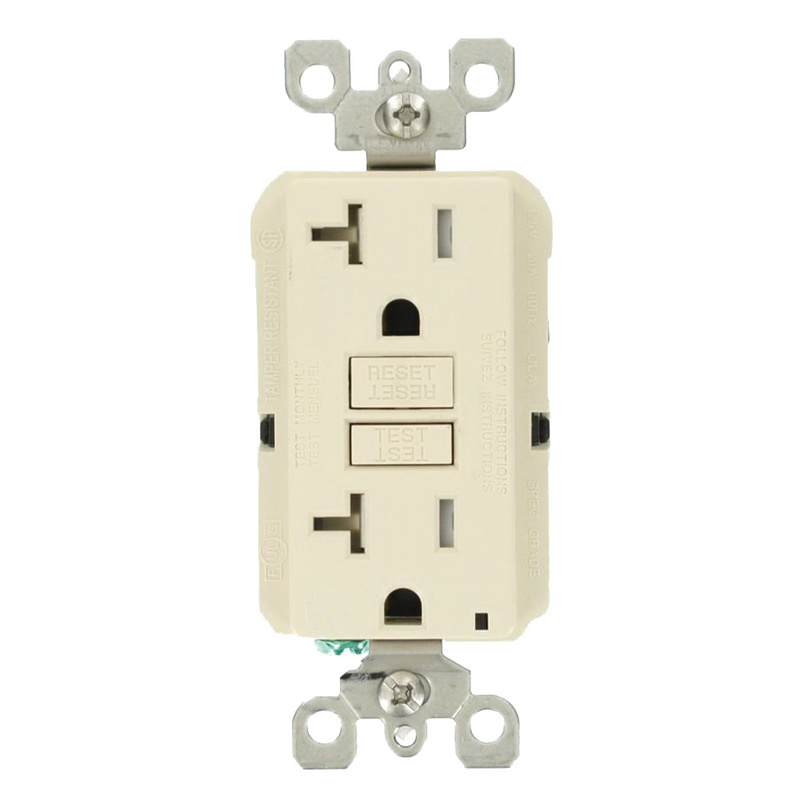 Leviton SmartlockPro® Slim 2-Pole 3-Wire Weather & tamper-resistant self-test GFCI duplex receptacle in light almond color, has voltage rating of 125-Volts and current rating of 20-Amps. It has short-circuit current rating of 10-Kilo-Amps. The residential grade receptacle accommodates 14 - 10-AWG conductor. It features back and side wired terminal connection for easy installation. It has polycarbonate face and body. It measures 3.81-Inch x 1.69-Inch x 1.4-Inch. The receptacle withstands dielectric strength of 1250-Volt AC. It has brass contact for optimal conductivity and stainless steel strap. It withstands temperature range of -35 to 66 deg C.
The receptacle has NEMA 5-20R configuration. It is suitable for use in residential and commercial applications. The receptacle is flush mountable. It has V-2 per UL94 flammability rating to withstand harsh environmental conditions. It offers continuous ground fault protection. It features status indicator light that provides intuitive feedback on power and protection status as well as indication of line/load reversal. Receptacle with patented lockout action, withstands high torque and resists wire pullout. It offers enhanced immunity to high-frequency noise while minimizing tripping. This receptacle is compatible with all Decora devices and wallplates. Self-test GFCI duplex receptacle is UL listed and CSA certified.